You guys ready for this? Man, that forest looks epic. I wonder whose arc that is. If the general setting hasn't changed too much, I would tend to think it's probably gonna be about Noah, but one can never know what Neorice is thinking. I already know this will be epic. Who will we reunite with this time? Will it be 3? Tobi? 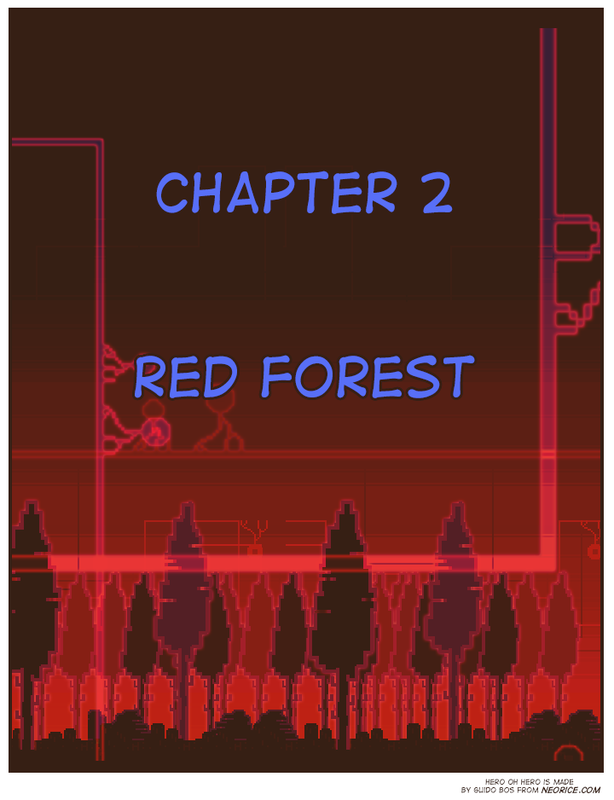 Whoever it is, obviously NOTHING BUT HAPPY THINGS WILL RESULT in a place called "The Red Forest". noah! say, burk's chapter lasted over 200 pages (and was quite satisfying). how long do you think this one will last? God I hope it's Tobi. Her arc was way more interesting than Noahs. It could be Burk again but then he would just be trolling us. Nearly every single page of the next chapter is using the double-sized page format so the pacing/update rate should be a lot faster. Because of this I *hope* to keep the next chapter under 150 pages. @Everyone. It's Noah's, it says so in the Archive. why red? there are other colors YOU KNOW? Noah is the cool guy on Burk's five step (with four steps) plan to be a hero. Oh. Yeah, okay. Well, Noah is cool too... I think? He's the detective right? I don't remember him very well. I am very excited. Am I as excited as I should be? ONLY TIME WILL TELL. You have to take a break from the red forest every ten minutes or you'll ruin your eyes. so hum...by now ive understood neorice is covering multiple characters, but are these independant story arcs in a common setting or is there ties between each character ? I believe Neorice is gonna troll us all, and this chapter will be about Nobi and Toah, magical wonder-twins that hunt desert mice on an eagle while singing songs accompanied by an over-sized balalaika. That means that it will take a year before we would be able to get back to Burk, if not Tobi! Do you plan to interconnect the worlds this time more? this is actually helping me with the upcoming ielts exam.